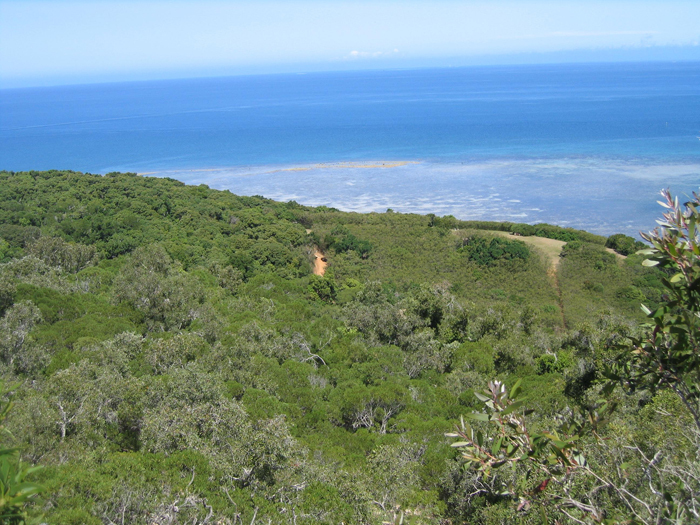 The dry forests, also called sclerophyll forests, are restricted to the lower elevations of the dry west coast of New Caledonia. As the elevation rises and precipitation increases, the dry forest gives way to rainforest. Where the soil is rich in heavy minerals (also called ultramafic or serpentine soil) the vegetation turns to maquis (shrubland). In its mature state, dry forests of New Caledonia are dense. Trees form a canopy that reaches 50 feet. Below the tree canopy is a dense layer of shrubs. Vines are also abundant. View of Ouen-Toro Provincial Park, Noumea, New Caledonia. A military base during World War II, it now a protected dry forest. The dry tropical forests of the world are some of the most threatened in the world, and those of New Caledonia are no exception. Since French colonization in the 1800s, much of the dry forested regions have been burned and cleared for crops and grazing. Introduced species of deer, cattle and goats have accelerated the destruction. Overgrazing and trampling impedes the regeneration of plants, which, given the nature of the dry forest, are slow growing to begin with. As a result of these activities, and the accidental or intentional setting of fires, the dry forests that once extended over the lowlands along the west coast of Grande Terre, only exist in small, disconnected fragments. Arid diversity The tropical dry forests in New Caledonia are home to 223 endemic plant species, 59 of which are restricted to tropical dry forest. The Atlanta Botanical Garden has a number of these plants in its New Caledonia collection. The following plants profiled in some cases grow not only in dry but also humid forest locations. ROYAL CREEPER Oxera pulchella (Lamiaceae) This elegant vine was a prized ornamental plant in the late-nineteenth century but has since fallen into obscurity. The first European explorers observed royal creeper and included it in their accounts of the islands’ flora. “Plant hunters,” always on the lookout for desirable specimens to sell to collectors and botanical gardens, took notice and so the royal creeper was among the first of New Caledonia’s native-plant exports. Efforts to revive interest in royal creeper are underway in New Caledonia. 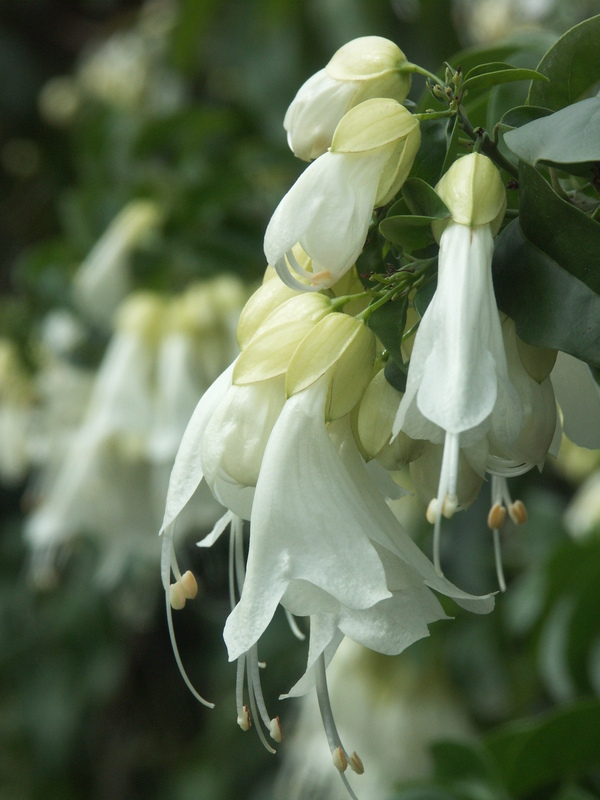 Royal creeper plants are now available to nurseries to produce and sell to local gardeners, and species of Oxera as well as other natives are being reviewed as candidates for the global ornamental plant market. Thanks to the gardeners of New Caledonia, Royal creeper is found not just in the dry forests but in and around Nouméa, the capital city, and other locations. TIARÉ FLOWER Gardenia aubreyi (Rubiaceae) The understory of a true dry tropical forest is populated by species of shrubs. One such shrub makes itself known by an intoxicating scent. Gardenia aubreyi (Rubiaceae) is known by its Polynesian name, Tiaré. Various species of Gardenia grow throughout the Pacific, and the Tahitian Gardenia (Gardenis taitensis) is a kind of national flower to French Polynesia and the Cook Islands. 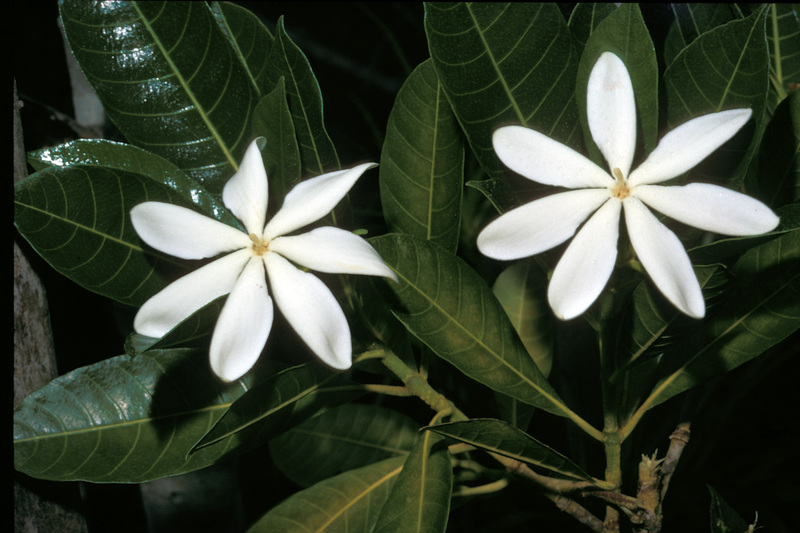 However, the Gardenia is native to Melanesia (which includes New Caledonia) and Western Polynesia. It is an aboriginal introduction to the Cook Islands, French Polynesia and possibly Hawai`i. Pittosporum gracile (Pittosporaceae) Pittosporum species are more abundant on New Caledonia than anywhere else in the world. The main island, Grande Terre, boasts 44 endemic species of Pittosporum and the Island of Pins has one endemic species of its own. 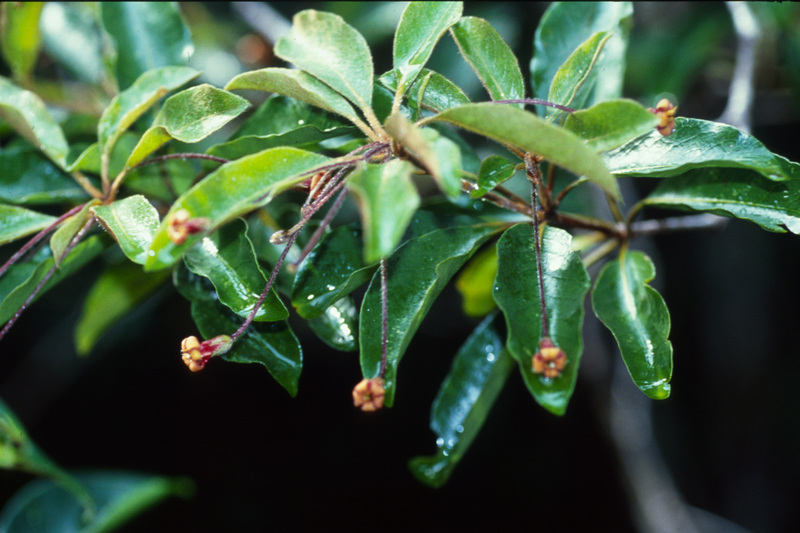 Pittosporum gracile can be found in the dry forests and is also of horticultural interest thanks to its attractive flowers and the lovely reddish-brown felting on its new leaves. Bouceht, Phillippe, Tanguy Jaffre and Jean Veillon. “Plant extinction in New Caledonia: protection of sclerophyll forests urgently needed.” Biodiversity and Conservation 4, 415-428 (1995). Gardenia taitensis. National Tropical Garden Database. Gâteblé, Gildas. “New Caledonia and its Potential for New Floriculture Crops.” International Society for Horticultural Science. Horticulture 813: VI International Symposium on New Floricultural Crops. Downloaded 7 August 2012.